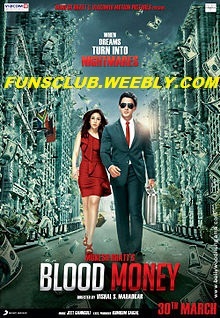 Blood Money is a 2012 Bollywood thriller film directed by Vishal Mahadkar and produced by Mahesh Bhatt. The film stars Kunal Khemu and Amrita Puri in lead roles. It released on 30 March 2012. The response from critics were mostly positive, and Blood Money did above-average business at the box office. Many critics compared the film to the Hollywood blockbuster Blood Diamond(2006) and to Bhatt's earlier directorial film Naam (1986), although it is not inspired by either.